In late 2016, after the following review was published, Zeiss came out with a modified and improved version of the Zeiss Victory SF binocular. See Michael and Diane's comparison of the new and original SFs. The following review also appears in the July, 2015, Bird Watcher's Digest. In Greek mythology, the Titans overthrew the previous, primordial gods, including their own parents. Myths tell truths, but truths that are not necessarily historical. Myths are stories of recurring patterns that continue timelessly. In our age, the myth of the Titans certainly applies to all things technological. New generations keep replacing the old. This article compares three of the current reigning 42mm binocular Titans—the new Leica Ultravid HD Plus, the Swarovski EL Swarovision, and the new Zeiss Victory SF. These binoculars are not priced for the faint of heart. Starting at around $2500, these are premium optics for the owner who wishes to acquire the state of the art. We'll begin with a general overview of the features of each manufacturer's product. We'll include an overall chart, which compares the features and shows how each binocular rates against the others. Then we'll drill down on the individual features in the chart. In building the SF, Zeiss decided to start over from scratch and design a brand new binocular. Their stated goal was to create the best birding and wildlife-observing binocular in the world. Better balance • Zeiss changed the prism system from the Abbe Koenig system of the Victory HT to the Schmidt Pechan prism system in the Victory SF. This allowed them to redesign the optics so that there is more weight in the eyepiece end and less in the objective end, shifting the center of gravity toward the eyes and giving the SF perfect balance. It is lightweight, thanks to the magnesium housing, but the improved balance makes it feel even lighter, even after extended viewing. Smart Focus (SF) • The new prism system also allowed Zeiss to place the focus knob where the index finger can reach it in a natural position, without having to angle to the side. It's comfortable. It provides a perceptibly better focusing experience. Triple bridge • The Zeiss SF has a lightweight, open-bridge design, like the Swarovski EL. However, the Zeiss has three bridge hinges instead of two. This adds strength without significantly adding weight and helps keep the barrels in alignment. The bridge spacing also allows more room for your fingers, and you have more choice in where you grip. Image immersion • The new SF optical design incorporates three elements that combine to create an experience of total immersion in the image. Long eye relief, for glasses wearers. You get the great image immersion experience even wearing glasses and using the 10-power model. Protective coating • Zeiss coats exterior glass surfaces with LotuTec®, which repels water and grease, causing water to bead up and drip off. It also reduces glare and reflections and makes the lens surface tougher. Zeiss the company • The Victory SF is manufactured at Zeiss in Germany. Zeiss has been making binoculars for over 120 years. They also make eyeglass lenses, camera and movie lenses, large telescope lenses, planetariums, and medical equipment. Other sizes • As of this writing, the SF is available only in 8x42 and 10x42. 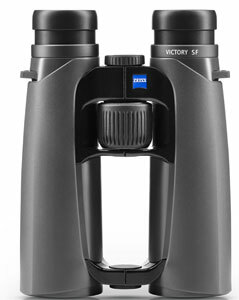 However, Zeiss also continues to make and sell their Victory HT binocular, which comes in an 8x42, 10x42, 8x54, and 10x54. Zeiss Victory SF Warranty • All Zeiss binoculars purchased from authorized US dealers carry a transferable, limited lifetime warranty against manufacturer's defects. The Victory SF binocular also carries a USA and Canada, non-transferable, 5-year "No Fault Policy" that covers damage during normal and intended use, provided the binocular is registered within 60 days of purchase. 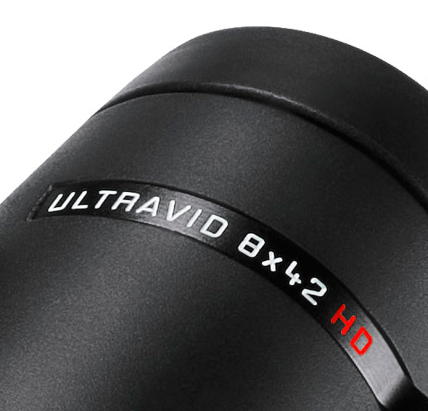 The new Ultravid HD Plus takes another leap upward from Leica's already highly respected Ultravid HD binocular line. The ergonomics and outer form remain the same, but inside, the prism glass and coatings have been upgraded. 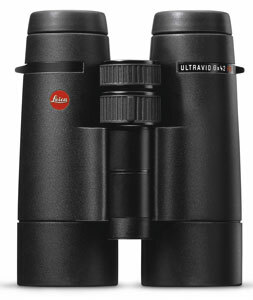 Looking at the binocular from the outside, how do you tell if it's the new Leica Ultravid Plus? The only difference is that the "HD" part of the name on the left barrel is red instead of white. Subtle. Light transmission, contrast, and resolution • In the HD Plus line, Leica uses a new kind of Schott glass, which offers an enhanced ability to transmit light in the blue-violet end of the spectrum. This ability is especially important at dawn and dusk. When the sun is rising or setting, light travels through more atmosphere, and much of the blue-violet light gets filtered out. The new glass enhances these frequencies and allows the viewer to make out more detail in dim light. Leica also employs an advanced plasma technology to apply newly formulated lens coatings to the lens surfaces. Light transmission is improved and stray light reduced, maximizing contrast and increasing perceived sharpness. We compared a Leica Ultravid HD side by side with the new Ultravid HD Plus. We did see that the whites looked slightly whiter through the HD Plus. Although we could not actually resolve measurably finer detail, the subjective impression of sharpness seemed enhanced. Protective coating • Leica protects exterior lenses with AquaDura™, an abrasion-resistant, hydrophobic coating that repels dirt and water, helps maintain clear visibility even in the rain, and makes fingerprints easier to remove. Sizes • The Leica Ultravid HD Pluses were the most compact of all the 42mm binoculars in our test. In addition to the 8x42 and 10x42 modelss we reviewed, the HD Pluses will also be available in 7x42, 8x50, 10x50, and 12x50. Great news for people who want a top binocular for low-light conditions. Leica Ultravid HD Plus Warranty • Leica includes a lifetime warranty against manufacturer's defects. In addition, Leica also includes a non-transferable "3 Year Passport Protection Plan," which adds three years of coverage for accidental damage to Ultravid binoculars bought from authorized USA dealers and registered within 30 days with Leica. The first EL • The EL Swarovski came out in 1999 and introduced to the world the open-bridge design that lets you wrap your fingers around a binocular barrel so that you can easily grip and use it even with one hand. It was a welcome advance in comfort and usability. Since its appearance, other manufacturers have often attempted this design, with varying degrees of success. The EL Swarovision • In 2010, Swarovski remodeled the EL into the elegantly designed EL Swarovision, which replaces the earlier EL's aluminum housing with lightweight, durable magnesium. The open bridge continued, but the barrels got slimmer and even more comfortable to hold. Swarovision for edge-to-edge sharpness • The introduction of Swarovision was a major upgrade to the EL. It utilized fluoride-containing HD glass in lenses, which provided improvements in color fidelity and freedom from chromatic aberration. This new EL has gained an enthusiastic following, in part for its remarkably flat field of view, which provides a sharp image, edge to edge, thanks to field flattener lenses. Eye relief • The Swarovision EL also set a new standard for generous eye relief, with 20mm on both the 8.5x42 and the 10x42 model, allowing glasses wearers to see the full field of view, even with a 10-power binocular. Snapshot adapter • Included with every EL is a Snap Shot adapter that lets you attach one barrel of the binocular to a point-and-shoot camera. Protective coating • External glass surfaces are coated by Swaroclean™, a non-stick coating on the lenses that makes it easier to clean away dust and dirt. Swarovski's culture • Swarovski is a family-run business, which makes crystal glass as well as sport optics. All its binoculars are made in Austria. The Swarovski website says the company is committed to courageous innovation and to creating objects that will last and serve for a lifetime. Located in an area surrounded by natural beauty, Swarovski states that they take pride in caring for and preserving the environment and that they make a point of conforming to the highest environmental standards. Other sizes • In addition to the 8.5x42 and 10x42 models we reviewed, the Swarovski EL Swarovision is also available in 10x50, 12x50, 10x32, and 8x32. Swarovski EL Swarovision Warranty • The ELs carry a lifetime warranty on the optical system when purchased by US residents from an authorized Swarovski Optik North American dealer. For warranty service, a copy of your receipt from an authorized dealer is required. The warranty does not cover accidental damage. However, Swarovski has a reputation for being very generous in providing warranty service. In the chart, some features are scored comparatively, from 1 to 10, 10 being the best. Others, such as Close Focus and Weight, show the raw data. The last column in the chart shows a calculated overall score, which takes into account all the other scores. This calculation also converts some of the raw data items into scores and integrates them into the final calculation. Now we're going to drill down on each feature in the chart and give some insight on how we evaluated the individual binoculars. We tested the resolution of each binocular, using a T-21-RP USAF 1951 optical resolution chart, from Applied Image Inc. For each magnification group, all three binoculars resolved equally when tested by a person with 20/20 vision. When we magnified the image using a doubler, we still could see no difference in resolution between the three Titans of similar power. It's fair to say that they all deliver resolution details far beyond your eye's ability to see. All six binoculars got a score of 10 on resolution. We focused each binocular at the center of the field of view and then looked to see how sharp the image was at the edges. Both the Swarovski and the Zeiss were razor sharp, both at the center and at the edges. The Leica image was perfectly sharp in the center but softened noticeably near the edges. When trying to see fine details, one automatically centers the bird in the field of view. So, one might ask, how important is sharpness at the edges, anyway? Although it may not help you identify a bird, an image that is sharp clear to the edges increases the subjective experience of immersion. It adds realism. The effect is especially striking in a binocular with a wide field of view, like the Zeiss Victory SF. Some birders have noted that field flattening technology can create distortion when you pan the binocular. Things seem to swell in the center, as if the image were wrapped around the surface of a sphere. It reportedly bothers only about 5% to 10% of users. Zeiss's field flattening technology was designed to minimize this rolling-ball effect. We did not see the rolling-ball effect when we panned with the Victory SF. Brightness • The brightness of a binocular is important to birders, especially if they like to go owling or want to watch woodcocks displaying at dawn. At sundown, we took the all the Titans outside and compared our ability see details on the resolution chart as the light diminished. Suffice it to say that these binoculars are all very bright indeed. It is a stunning experience to look through any of them in low light, when with the naked eye you can barely make out any detail. However, we found no perceptible differences in the brightness of these binoculars. This is what one would expect, considering they all have special glass and the most advanced coatings. They all have light transmission specifications well over 90%, and it would take expensive scientific instruments to objectively detect any difference this small. Experts in vision say that the unaided human eye is not a reliable instrument for measuring small differences in brightness, because the brain is always involved in seeing, interpreting what we see. For example, in the image below it seems obvious that the right page is darker than the left. 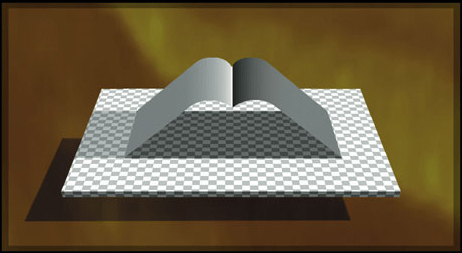 But as soon as you cover the fold with your thumb, you see they are the same shade of grey. To learn more about how we see and to be amazed by other great illusions, check out lottolab on the Internet. How close you can focus a binocular also depends on the focusing ability of your eyes, and this varies from person to person. Since the manufacturers' methods of measuring may also vary, we measured the close focus ourselves, using one individual's eyes. In our testing Swarovski scored the best, with Zeiss coming in a close second, and Leica a distant third. At 1000 yards, you see a train, going left to right. How many cars can you see? Now substitute "feet" for "cars," and you'll understand how "field of view" is specified in the chart. At 1000 yards, the width of the image of the Leica 8x42 is 389 feet. The Swarovski 8.5x42 is 399 feet, and the Zeiss 8x42 is 444 feet. A wide field of view helps when you're trying to locate a bird in the binocular. Birders love a wide field of view. However, binoculars with a wide field of view usually have short eye relief, which is bad news for glasses wearers. To create an eyepiece with long eye relief and a wide field of view requires a sophisticated, expensive optical design. As you can see from the chart, the Zeiss SF sets a new level of achievement in providing a wide field of view even for people who wear glasses. All these binoculars have twist-out eyecups. Twist in for use with glasses, and twist out for use without glasses. They all have indents for intermediate positions. If the indents don't match up with your face or type of glasses, you have the option to custom dial them to any length. The Eyecups Range column shows the difference, in millimeters, between the shortest and the longest positions, according to our measurements. It's in the chart for reference, but it was not used in calculating the overall score. Some people's eyes are very close together. Some people's eyes are very wide apart. The chart shows the range of adjustment available, in millimeters, for each binocular. If you have had a problem getting a binocular to match the distance between your eyes, the Zeiss SF has the best chance of fitting your needs. We did not include the interpupillary distance in the overall score, however, because to most users the maximum and minimum do not matter at all. All these binoculars have magnesium housings, making them as light and strong as possible. We weighed the binoculars ourselves, without any straps or lens covers, using a Pelouze postal scale. From the lightest to the heaviest, the difference was less than three ounces. The Leica 10x42, at 26.7 ounces, was the lightest of the bunch and got a "10." It's interesting that the Leica 10x42 weighs slightly less than the Leica 8x42. The Leica is the most compact, at only 5.63 inches long and 4.75 inches wide, which is near the size of many 32mm binoculars. The Swarovski is 6.3 inches long. The Zeiss is the longest, at 6.8 inches. We included compactness in the overall score, giving credit for compactness. All these binoculars' optics are inert-gas purged, sealed, and waterproofed. The quality of the seal determines the degree of protection against fogging up in humid environments and ruining your trip to Costa Rica. The waterproof specs show how deep under water you can hold the binocular before its seals will fail. These are the manufacturers' data. We did not try to drown the binoculars ourselves. All these binoculars have their diopter adjustment mechanism on the center column with the focus knob. This location is more ergonomic than diopter adjustments done by turning one of the eyepieces. These diopter adjustments all lock and have some kind of scale. We especially admire the Leica's diopter adjustment. It is beautiful, and you can see the setting instantly any time you glance down at your binocular. We thought its elegance deserved an extra point. The Zeiss's setting is also easy to see, but not quite so easy as the Leica's. To see the Swarovski diopter setting, you have to turn the binocular sideways. It does, however, have a numbered scale, making it easy to remember the setting. This is useful if someone else has used your binocular. Many binoculars have hollows or ridges on the barrels to help locate your hands. Grasping the binoculars the same way each time reinforces the muscle memory you use to instinctively point the binoculars at the bird. You want your index finger to land easily on the focus knob, but you don't want the binocular's strap lugs to press against the web of your hands. Each binocular in our test has a different solution. Leica has prominent thumb guides that stick out, while Swarovski has shallow indentations underneath the barrels. The Zeiss barrels do not have thumb guides. Instead, it's where your fingers contact the bridge that functions as the guide. Leica • (Left photo, below) With your thumbs below the ridges, your index finger falls comfortably, straight across, on the focus knob. However, to get two fingers on the focus knob, they have to be at a slight angle. You can get better two-finger contact with the focus knob if you move your thumbs above the ridges, but then the strap lugs contact your hands. For some, the ridges may interfere with their preferred location of the hands. The focus knob has two sections, and it is wide enough to use with a glove or with two fingers. One section also functions as the diopter adjustment. 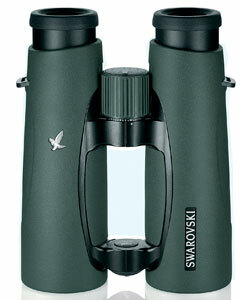 Swarovski • (Middle photo, below) Its shallow thumb indents allow more range for where you grasp the binoculars. They suggest a placement but don't force it. It's easier to grasp closer to the strap lugs and get two fingers on the focus knob. The Swaroski's focus knob is a little less wide than the Leica's but still wide enough for use with gloves or with two fingers. The focus knob snaps out to become the diopter adjustment. Zeiss • (Right photo, below) There are no ridges or indents on the barrels. You can locate your hands wherever you want. The Zeiss's barrel length is a plus here. The extra space in the hollow of the bridge is good for people with large hands. The bridge replaces the thumb guide. With three fingers in the bridge, one finger lands on the focus knob. With two fingers in the bridge, two fingers land on the focus knob, and your hand is still clear of the strap lugs. In either position, your focusing fingers remain in a natural, un-angled position. Someone put a lot of work into good ergonomics here. The SF's focus knob is the least wide of all the focus knobs but still wide enough for gloves or focusing with two fingers. The SF's ergonomic finger placement makes it especially easy to use two fingers to walk along the knob. The SF's diopter adjustment is not part of the focus knob but has its own separate dial. Focusing speed 20 ft to 250 yds • How many turns of the focusing knob it takes to move from close to far is an indication of how fast you can focus a binocular. We measured how many turns it took to go from 20 feet to 250 yards. We think that this range reflects much of a birder's experience in the field. The Leica took 2/3 of a turn to cover this range. The Swarovski did it in 1/2 a turn. We found the Zeiss SF covered the distance in 1/3 of a turn, the fastest speed of the three. It's fast, but not so fast that one overshoots the point of focus. Focusing speed 20 ft to close focus • We measured how many turns it took to go from 20 feet down to the closest the binocular would focus. We found the Zeiss took 1-1/2 turns to get to 5.4 feet, and the Swarovski 1-2/3 turns to reach 5 feet. The Leica took only ¼ of a turn, but as its closest focus was 9.6 feet, it did not have so far to go. However, focusing speed is a personal choice. We provided the data but did not use the focus speed as part of the calculation of the overall score. How you rank that feature is up to you. The overall score takes into account most, but not all, of the items in the chart. A few items, such as interpupillary distance, show the data for reference only but do not affect the relative scores. Some of the features are weighted more heavily than others. For example, field of view counts more than close focus. The Zeiss SF comes out clearly on top. This is not surprising, since Zeiss started from scratch and completely redesigned the SF with the express intention of creating a product that would beat the competition on as many metrics as possible. The new SF design scored well both in optics and ergonomics. SF Optics • The SF combines a huge field of view with edge-to-edge sharpness and long eye relief. The combination provides an exceptional experience of immersion in the image that works even if you wear glasses. The binocular seems to disappear, and all your attention is on the bird. SF Ergonomics • The SF is an incredibly comfortable binocular. Its perfect balance makes it feel light. There's less small muscle activity needed to hold it up to your eyes, so you can observe longer without fatigue. SF stands for Smart Focus, and the new design allows the focus knob to be turned either with one or with two fingers without having to reach at an angle or feel the strap lugs poke your hand. You can focus from 20 feet to 250 yards with only 1/3 turn of the focus knob. That's one easy finger swipe. Personal choice • We are keenly aware that how well a binocular scores in this kind of comparison is not as important as your personal choice. No test by someone else can tell you how well a binocular will fit your hands. The compact size of the Leica may be an important issue. Or you may be used to the ergonomics of a particular brand and not want to change. A good binocular becomes a trusted friend. On the most important features, resolution and brightness, all of the Titans are equal. Any one of them would be a happy choice. It's up to you. Even if you don't have $2500 to spend on a binocular, you can still have wonderful birding experiences. Moderately priced optics are better today than they were even a few years ago. For most of us, a mid-level binocular will deliver more resolution than our eyes can see. Copyright 2015 Birdwatching Dot Com.